The 2017 Players Championship golf tournament on the PGA Tour is taking place this week from May 11-14, 2017, at the TPC Sawgrass golf course located just outside Jacksonville in Ponte Vedre Beach, Florida. Here is a list of the playing field of top PGA golfers for the 2017 Players Championship. 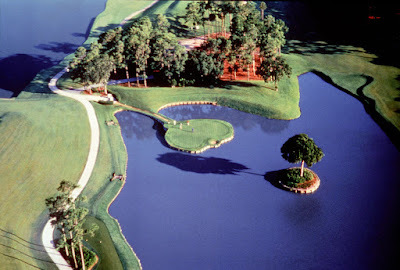 The Players Championships offers one of the richest prize money purses in golf and virtually ever eligible golfer in the world plays in this event annually. So it's much easier this week to just list the eligible players who are not going to be playing this week. There are four eligible players who are not playing in the 2017 Players Championship. Brandt Snedeker and Colt Knost are both out due to wrist injuries. John Senden is skipping the tournament because his 13 year old son was just diagnosed with a brain tumor and hopefully he will make a full recovery. Tiger Woods is eligible but will not play as he skips the 2017 PGA season to recover from another back surgery. Top ranked golfers in the playing field who have won the Players Championship not listed above include Martin Kaymer (2014), Matt Kucher (2012), K.J. Choi (2011), Phil Mickelson (2007) and Adam Scott (2004). Golf major winners in the playing field not already included above are Keegan Bradley, Jason Dufner, Ernie Els, Jim Furyk, Lucas Glover, Zach Johnson, Bernhard Langer (Senior Champion last year gains entry this year), Graeme McDowell, Louis Oosthuizen, Charl Schwartzel, Webb Simpson, Vijay Singh, David Toms, Bubba Watson and Danny Willett. Except for the four eligible golfers listed above who are not playing (Brandt Snedeker, John Senden, Colt Knost and Tiger Woods) anyone and everyone in the world of golf is playing in the 2017 Players Championship which makes this a must watch event for golf fans. As a final note, Grayson Murray is in the 2017 Players Championship field because he won the 2016 Web.com Tour Finals. He is probably the most unlikely player to win this event this week but he does have youth on his side as he's 23 years old.